I was excited to make a return trip to LudoBites after luckily snatching up a cancellation on OpenTable. Ludo changes up the menu pretty frequently, so it was exciting to be able to try some of the new dishes as well as some of the favorites from opening night (the chicken being one!). 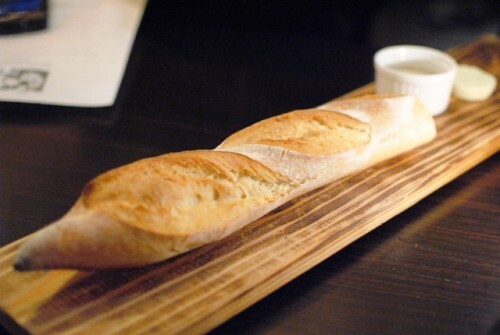 I always really enjoy the baguette at LudoBites, and it was wonderful again here. This was one of my favorite dishes from before; tender slices of hamachi are paired with crispy lotus root, fried shallots and a little bit of acidity. 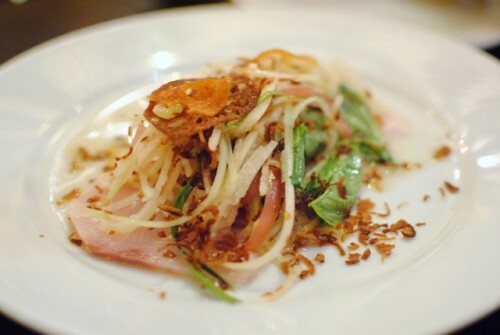 This was a new dish for me; actually, I think it debuted on this night. The escargot was very tender and covered with a nice, richly flavored mole. The sweet corn ice cream was phenomenal. However, I don’t think all of the components really melded too well together, though I enjoyed each on its own. 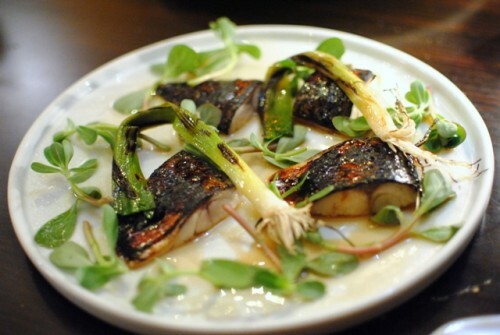 The mackerel was even better than I had remembered it last time. The ponzu marinade added some depth of flavor and a little acidity. The skin was topped with sugar and bruleed. 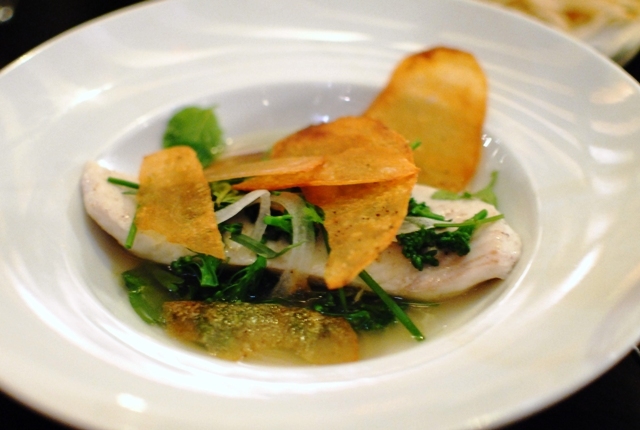 Loved the interplay of the moist fish and crispy skin. This dish was similar to one served in the latter days of LudoBites 5.0. 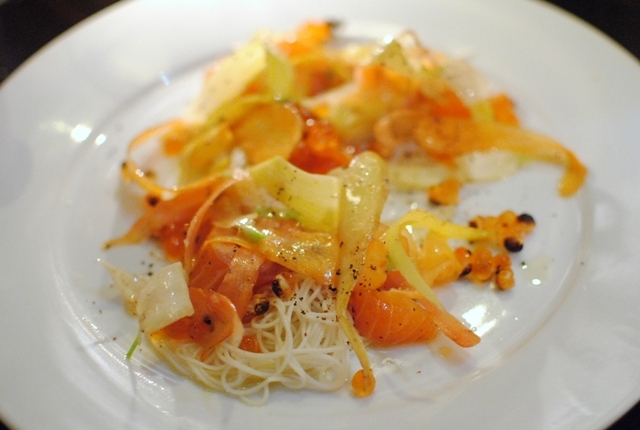 The shaved carrots and turnips added a nice textural component to the tender salmon. I don’t think the somen noodles added too much though. 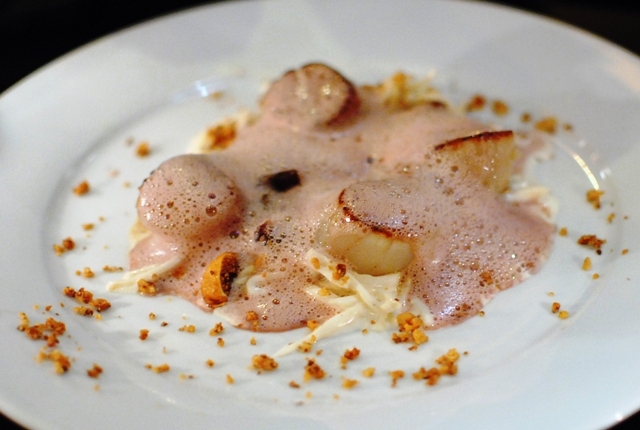 The scallops were beautifully seared with a nice crust; the interior was moist and tender. 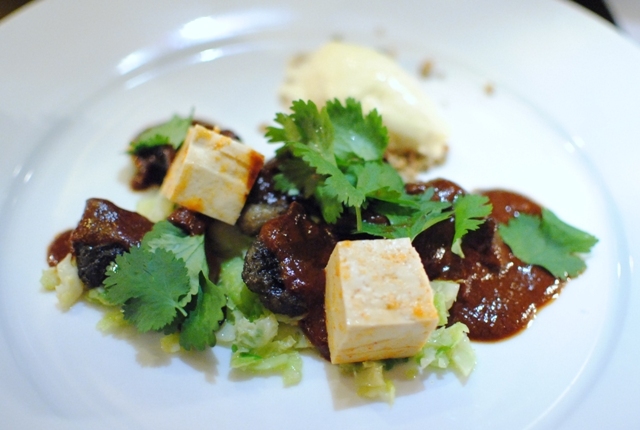 The walnuts and celery root added the textural component. Very nice. I really liked the presentation of this dish. 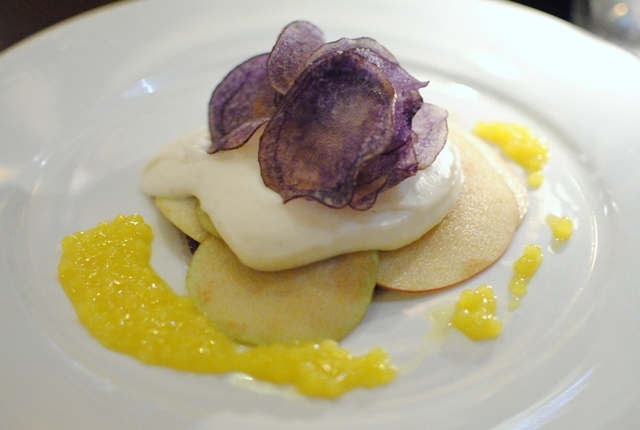 The boudin noir pudding was topped with apples, duck fat mashed potatoes, and purple potato chips. I love meat and potatoes, so the boudin noir combined with mashed potatoes was great, with the apples and chips adding some sweetness and texture, respectively. The mustard “boba” added a little bit of heat to the dish as well. This dish has evolved a bit since opening night – for the better. 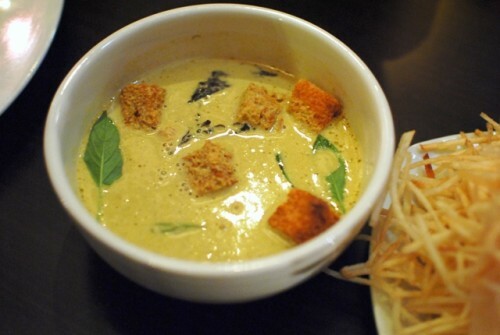 The veloute had pureed mussels in it, adding a rich mussel flavor. We tried both mixing the fries in the soup as well as keeping them separate. I preferred to keep them separate so that I could get the crispiness of the fries in each bite. Another nice presentation. 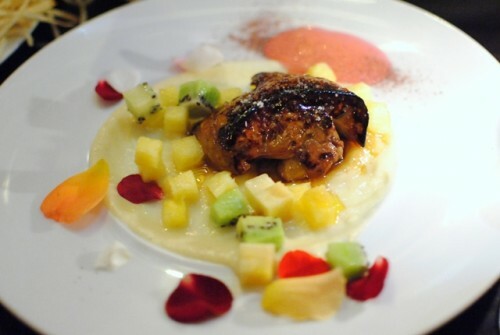 The rich foie gras was complemented well with the sweetness of the mangoes and honey. The foie gras was cooked perfectly. The fish was cooked well, and I enjoyed the greens and the crisped potatoes for texture. The herbaceous broth was very strong and fairly bitter – taking small sips was key. 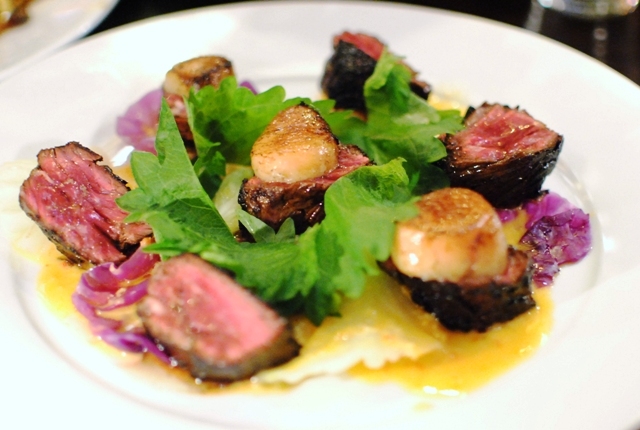 This was one of my favorite dishes from before, and it still is. The chicken, cooked sous vide and then crisped, is so moist and tender. The chorizo is not very apparent, but I don’t think that bothered anyone. 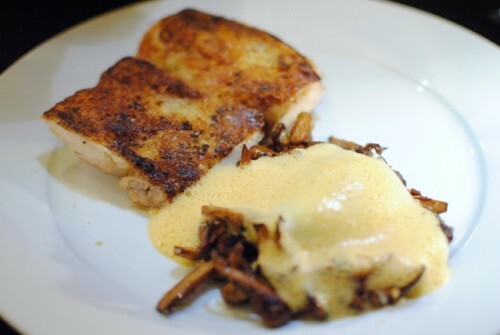 Complementing the chicken were tender and earthy chanterelles and a runny poached egg. Wonderful! I missed the Nebraska ribeye served earlier, but this steak was definitely more dynamic and flavorful. The crispy kimchi was tasty, and added some heat and texture. The bone marrow added some extra richness to the dish, though I didn’t think it was necessary for the dish to be successful. I’m not really a fan of carrot cake, but this version is a little different from a ‘typical’ carrot cake. Served warm and moist, the cake had a good carrot flavor. The kaffir lime oil, mango sorbet, and thai curry cream was really interesting, bringing strong east Asian flavors together. This was a new dessert for me. I’ve never had caviar in a dessert before, so this was a very new experience. The panna cotta had a nice vanilla flavor, and was smooth and rich. 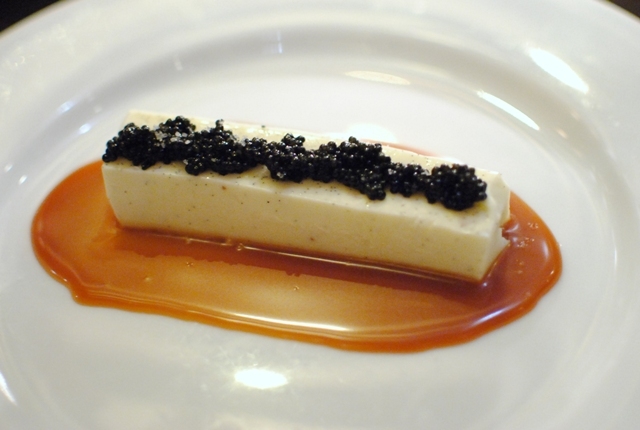 The richness of the panna cotta and caramel were complemented by the briny and salty caviar. 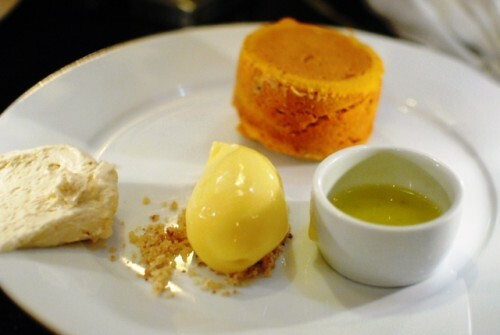 Really interesting, and definitely a memorable dessert. I enjoyed this meal a little bit more than my previous 6.0 meal – the “new dish” highlights for me this time were the boudin noir and panna cotta. Those aren’t alone in the dishes I’ll remember LudoBites 6.0 for – the hamachi, mackerel, and chicken are just some of the others. That panna cotta looks awesome! Great dinner, great company. Can’t believe we were still there at 1am. That mackerel was memorable! Thanks for the invite. Mmm… I remember that panna cotta from the Ludobites when it was at Breadbar. That was my favorite thing and I’m so glad he brought it back. Weezer – Thanks! 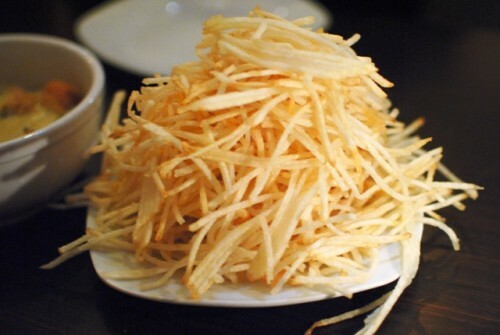 Definitely a unique dish. Linden – Haha yeah…it was a LONG night, but went by quickly. Glad you could make it! Julie – I’m sad to have missed it before…I’m glad he brought it back too!